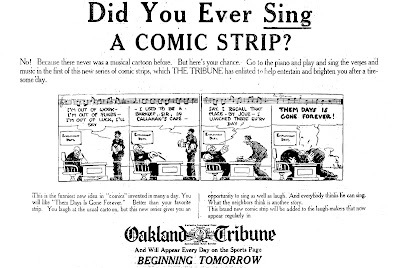 Kleefeld on Comics: Did You Ever Sing A Comic Strip? A recent discovery of mine has led to a much larger one. I was digging around for information on the old Everett True comic strip and stumbled across Barnacle Press where they're housing a huge number of old comic strips. Scanned at pretty decent resolution and cleaned up (a bit) for all the world to see. Obviously, it's all public domain stuff but there's famous works like Barney Google and Katzenjammer Kids to more obscure titles like Diana Dillpickles and Soosie the Shopper (which apparently only lasted a couple months). Lots of great comics to find and enjoy there, plus they seem to update it fairly regularly. Now that is exactly the type of comic history you don't find in books about the subject. That's the beauty of the internet and exactly the reason why you should check out Barnacle Press!